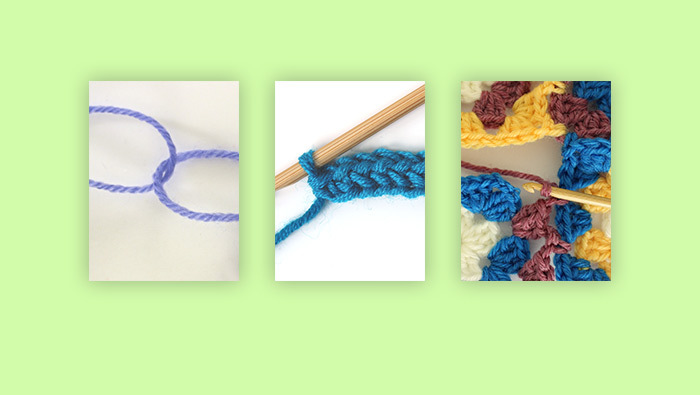 Most of us are always on the look-out for practical tips to make crochet easier or faster. I took a look at my videos and selected three that people have found useful. Are you familiar with them all? Like for most things, there are any number of ways you can join new yarn when you run out, or when you change colour. Most of them work fine but many are slow to do. The only one I would definitely not recommend is using knotting. It makes such a hard spot in your work. The method I’m showing on this video works great on fine and medium weight yarns. 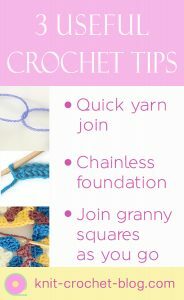 Most of the time you start a new crochet project by making a chain. But if you will have single crochets for the first row, why not make the chain and the first row at the same time. See the video how that works. You can join granny squares in lots of ways after you have finished them. 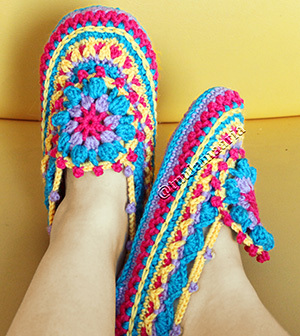 You can sew them or crochet them tohether using many different methods. One way to do it is to corochet the squares together on the last row. This works when you don’t want a seam that shows clearly. You also need to know the order of your squares when using this method. Here’s part of a bedspread I made joining on the last row. I have used a number of different cotton yarns for the bedspread but one of my favourites is Catania yarn. And here’s the video to see how to join the squares as you go.